Rediff.com » Business » Can the book shelf be replaced with e-readers? Can the book shelf be replaced with e-readers? Amazon pioneered the e-reader through Kindle, and Apple set the trend with its much-publicised iPad, launched in April this year. While iPad received a huge response with 50,000 units sold in the first hour and about 300,000 on the first day, the phenomenon may be repeated with Samsung's Android-based tablet PC, the Galaxy Tab, which was unveiled this month. The question now we ask ourselves is, is now the time to replace our much-cherished books and newspapers in the big book shelf with a compact e-reader? Though electronic publishing has existed since the advent of the web, it is the new generation of e-readers that are likely to improve the user experience and, hence, the adoption of e-content, especially e-books and e-newspapers. An e-reader is an electronic device, designed primarily for reading digital books and periodicals. A typical e-reader supports 6- to 9.7-inch display screen, weighs between 300 and 600 grams, uses either e-ink monochrome display, used in devices like Amazon's Kindle and Barnes & Noble's Nook, or color LCD screens like those used in Apple's iPad. Compared to the developed countries, where most people are exposed to the internet and computer-based reading, online reading habit in India is much less, thanks to poor PC and internet penetration. The PC penetration, even in urban households, is just about 30 per cent, while the internet user base stands at a poor 7 per cent of the population. The other barrier in e-readers' adoption is the one-time cost of the device, considerably higher than the conventional books. The present price of e-readers in India ranges between Rs 10,000 and Rs 35,000. Colour screen e-readers like iProf costs about Rs 15,000, with iPad yet to be introduced in India. Also critical to the success of e-reader adoption is the availability of appropriate content. Traditional e-readers sold in the US are bundled with content provided by book stores like Amazon and Barnes & Noble. Newspapers like Wall Street Journal are available on subscription on the iPad. 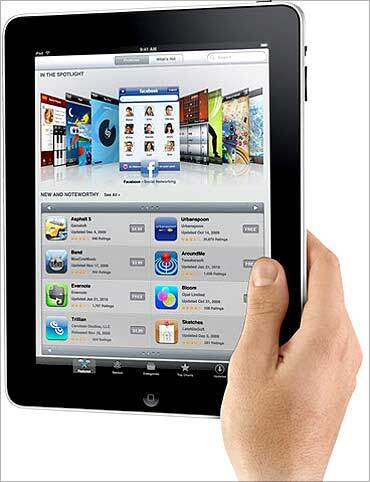 The iPad also plans to support select 10,000 applications in the AppStore developed for iPhones. This requires an ecosystem comprising device vendors, application developers, content providers and publishers, collaboratively working together. There are other intangible benefits of using e-readers in schools and colleges. It is well known and researched that the weight of bags of school-going children cause serious neck and shoulder injuries. In a move that could well set a trend, the Kendriya Vidyalaya Sangathan earlier this year came up with a graded formula that prescribed weight limits on schoolbags of its students in the range of 2 kg to 6 kg. An e-reader can easily fit into the bags of even small children, making these easy to carry. The e-readers can also transform the way students learn from static book content to active learning, enabled by dynamic content download in real time from the internet and other sources. What could be a better way for device manufacturers to earn carbon credits and students to reduce paper consumption by switching from heavy book-laden bags to smart lightweight e-readers? This article is authored by Subhash P, V Sridhar, and Siddharth Gaikwad of Sasken Communication Technologies. Views expressed are personal.